Good design is for everyone, and Ute believes that it is the result of a research-based solution reflecting your individual needs, desires and vision. She provides original and timeless interiors by creating functional, yet comfortable and beautiful spaces that fit your lifestyle and budget. Her mission is to bring a high level of creativity, integrity and personalized attention to complete every project. Her forte is space planning and creating detailed, to scale CAD drawings. A good set of plans with colored perspectives will help you to visualize the final look of the space. Most importantly, it is the roadmap that serves as the planning and communication tool not only between the homeowner and the designer but also with the contractor, plumber, electrician and other trades that will work on your renovation. 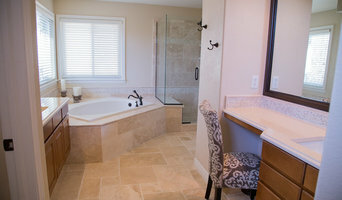 Denver's Luxury Home Remodeling Solutions | Best of Houzz 201! ConcretePete LLC designs, fabricates, and installs eco-friendly, artisan concrete countertops, sinks, fire pits, and furniture to the Colorado front range and beyond. We also work in steel and wood. *Authorized Fieldstone Cabinetry Dealer* Classic Cabinets & Design is the Boulder County resource for all your kitchen and bath design needs. We strive for excellence in design, product quality, and service. Visit our showroom, where our fully functional kitchen displays show you just how functional and beautiful your kitchen can be. Designing a new kitchen or remodeling an existing one should be a fun, positive experience. We want you to enjoy the process. Start Dreaming today and make it your reality tomorrow! We are here to help. BEST OF HOUZZ WINNER. CUSTOMER SERVICE Trinity Kitchen Design is Denver's preeminent Kitchen & Bath Design firm. Our process starts with listening to your specific needs and understanding your individual style. Designing is more than simply selecting finishes and placing cabinets, it’s bringing your feelings, style, ideas, and functional needs to life; Trinity Om's 20+ years of experience provides assurance that we are creating both a home and a life that you love. We tailor each space to compliment your personality, because our mission is to help make your house feel more like your home. If you have been dreaming of your perfect kitchen or bathroom, call us today to take the first step to making your dream a reality. Bunn & Sons Home Renovations provides kitchen and bath remodeling, basement finishing and custom projects in the Broomfield, Louisville, Lafayette, Arvada, Westminster, Boulder and other North Denver Metro areas. Handmade in Colorado, Armani Fine Woodworking is your source for Premium Butcher Block Countertops and Hardwood Countertops. Top quality, sustainably sourced hardwood products including: Edge Grain Butcher Block Countertops, End Grain Butcher Block Countertops and Hardwood Plank Countertops. We take great pride in our small, highly skilled team of craftsmen and our commitment to premium quality handmade products. Because of this, we’re certain you’ll love your Countertop, Butcher Block or Custom Order. We hope to make you our newest happy customer. Everything you see is customizable. We offer instant online quoting on many products. If you have a question or a request for further customization don’t hesitate to contact us. 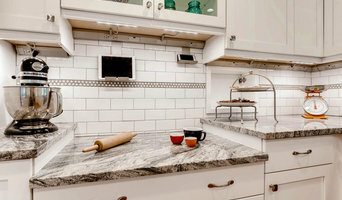 Heritage Tile Marble & Granite is a family owned and operated full kitchen and bath design and remodel business. we offer the full project from design and cabinetry sales, to stone countertop fabrication, installation and tile. We specialize in maintaining the highest of quality control while providing top of the line customer service. We get personally involved with every project and complete it to the level we would like to have it in our own homes. 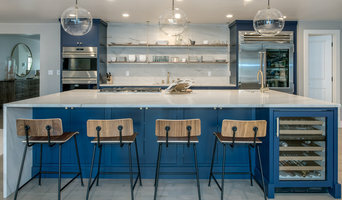 Best of Houzz 2013 - 2018 Certified Master Kitchen & Bath Designer Certified Aging in Place Specialist Certified Living in Place Professional Studio Design bridges the gap between the trades people and clients' understanding of the process. Material, installation costs and specialized terminology can be intimidating to homeowners and my clients rely on Studio Design to create the uniform vision of the project for installers, fabricators and manufacturers. Being an expert in my field enables me to work with whatever style you're seeking.